Home / Community / Applewood Plumbing Heating & Electric Achieves Denver Post Top Workplace! 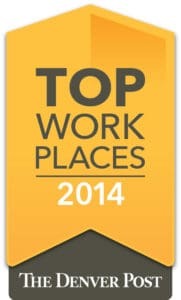 Applewood Plumbing Heating & Electric Achieves Denver Post Top Workplace! Applewood Plumbing Heating & Electric has achieved the Denver Post’s Top Workplace designation for the third straight year. The designation is based on employee feedback and company performance and policies. The designation of being one of the best places to work in Denver recognizes Applewood’s effort to keep up with an industry facing large growth in employment. The employment of plumbers alone is projected to grow 21 percent from 2012 to 2022, faster than the average for all occupations, according to the Colorado Department of Labor & Employment. Ward said, “This growth will be the result of a time when we start to see an entire trade generation retiring.” With more than 120 employees, Applewood has remained committed to creating a rich company culture. An approach that will be important as the skilled trade industry is losing interest to the heavy push for high school graduates to receive a college versus trade degree. The average yearly wages for skilled trade employees is higher than that of teachers and police officers, both of which require four-year college degrees. Applewood has seen unprecedented growth over the past five years and is always interested in hearing from experienced professionals interested in working for the company, Ward said. Applewood serves customers in the Denver metro area, Boulder and Longmont. The company has positions open for licensed plumbers, experienced HVAC technicians and service managers. As one of best companies to work for in Denver, Applewood offers excellent benefits coverage, competitive wages, a wellness program and appreciation programs that include company picnics, holiday gatherings and team bonding events. Applewood also supports employee needs with updated technology, comfortable working environments and trucks fully equipped to fulfill customer service requests. Applewood’s technicians have more than 1,000 combined years of trade experience. All of them are licensed, background checked and drug tested. There will always be demand for plumbers, HVAC technicians and electricians, according to Ward. The current room for growth welcomes room for more companies to strive to be Top Workplaces, like Applewood, in the skilled trades industry. John Ward founded Applewood Plumbing 40 years ago. He continues to run the family business with his son, Josh. For more information about Applewood Plumbing’s services and employment opportunities, call 303-232-6611 or visit www.ApplewoodFixIt.com.